"Dress fabric" is a colloquial Estonian word for the cloth used for making dresses. 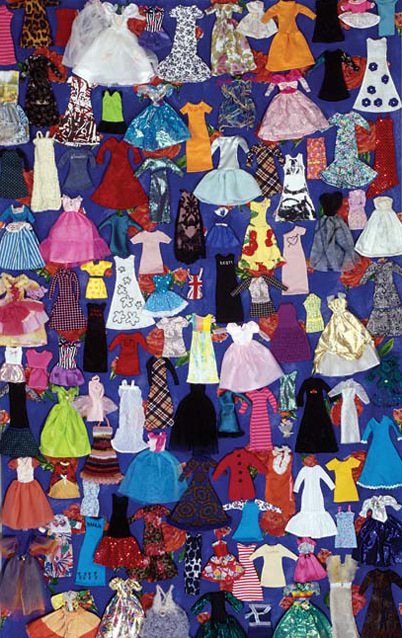 Yet in my work, it is the other way round –– it is a fabric made of dresses, Barbie doll dresses, to be more precise. Some of them were bought, others made or received as gifts from friends and acquaintances. 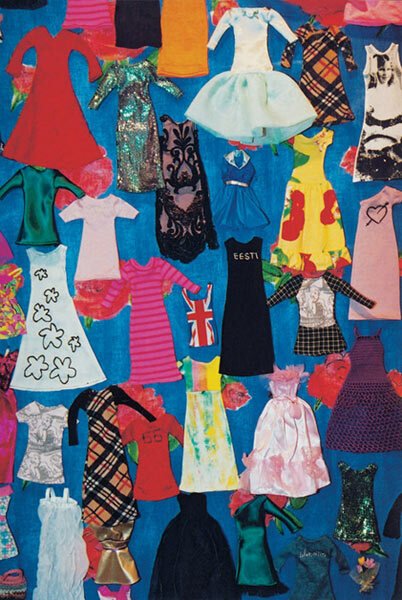 The piece also includes mini replicas of particular dresses, for example Geri Halliwell's Union Jack dress and a dress owned by my former teacher and present colleague, the rector of the Estonian Academy of Arts, Signe Kivi. She wore the dress to the Independence Day Presidential Reception when she was the minister of culture. It is a simple sporty dress, the top of which shows not the words "Adidas" or "Nike", but an embroidered "Eesti" (Estonia).